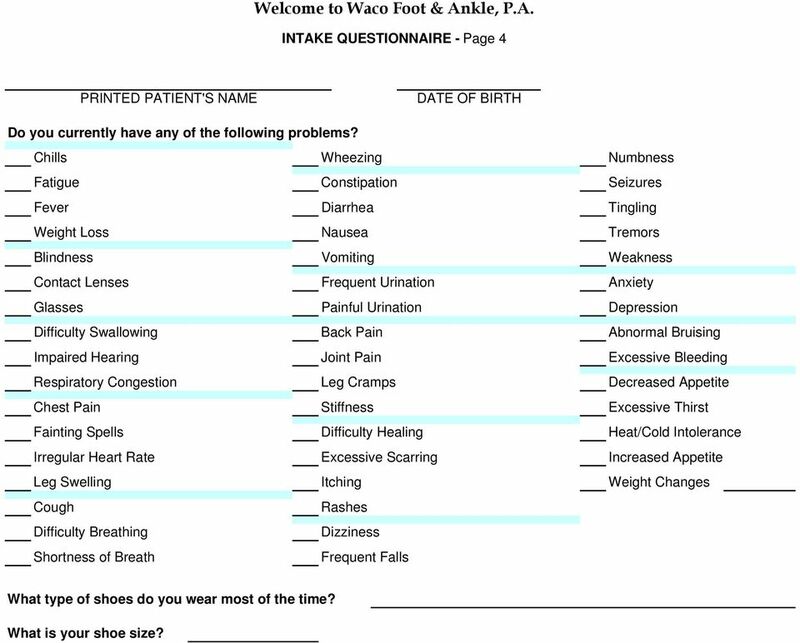 Download "PATIENT DEMOGRAPHICS & INSURANCE INFORMATION"
5 Waco Foot & Ankle, P.A. INTAKE QUESTIONNAIRE - Page 3 Marital Status: Single Married Divorced Widowed Living Conditions: Alone With Spouse With Spouse & Children With Parents Nursing Facility or Assisted Living ( ) Other: Name of Facility Employment Status: Full-Time Part-Time Retired Disabled Unemployed Student Employer: Type of work: Family Medical History: Grandfather: Bleeding Disorder/Blood Clots Cancer Diabetes Heart Problems Neurological Grandmother: Bleeding Disorder/Blood Clots Cancer Diabetes Heart Problems Neurological Father: Bleeding Disorder/Blood Clots Cancer Diabetes Heart Problems Neurological Mother: Bleeding Disorder/Blood Clots Cancer Diabetes Heart Problems Neurological Sibling: Bleeding Disorder/Blood Clots Cancer Diabetes Heart Problems Neurological Tobacco Use: Never Former Smoker Year Quit: Current Smoker Smokeless Tobacco Illicit Drug Use: Never Former Drug User Current Drug User What illicit drugs do/did you use: Alcohol Use: Never Former Drinker 1-7 Drinks per week More then 7 drinks per week Exercise: Never 1-3 timer per week More than 3 times per week Daily What type(s) of exercise do you perform? 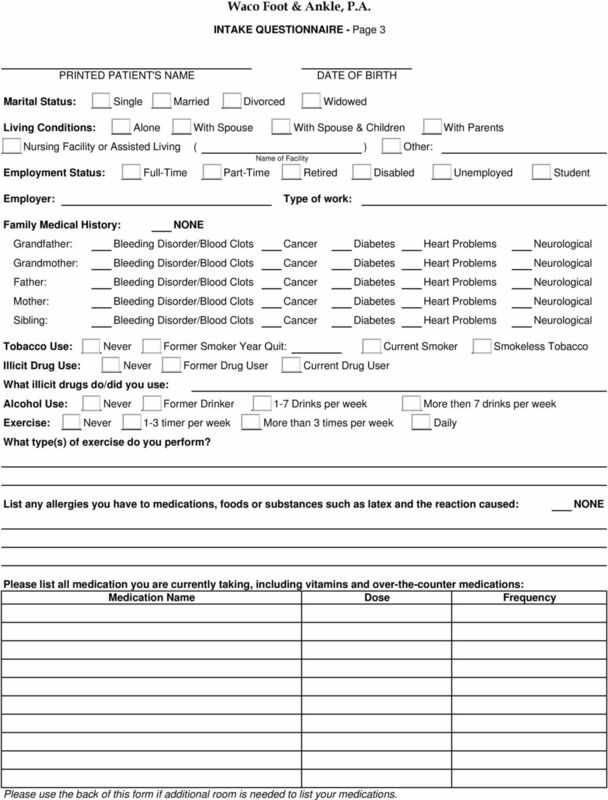 List any allergies you have to medications, foods or substances such as latex and the reaction caused: Please list all medication you are currently taking, including vitamins and over-the-counter medications: Medication Name Dose Frequency Please use the back of this form if additional room is needed to list your medications. 6 Welcome to Waco Foot & Ankle, P.A. INTAKE QUESTIONNAIRE - Page 4 Do you currently have any of the following problems? Chills Wheezing Numbness Fatigue Constipation Seizures Fever Diarrhea Tingling Weight Loss Nausea Tremors Blindness Vomiting Weakness Contact Lenses Frequent Urination Anxiety Glasses Painful Urination Depression Difficulty Swallowing Back Pain Abnormal Bruising Impaired Hearing Joint Pain Excessive Bleeding Respiratory Congestion Leg Cramps Decreased Appetite Chest Pain Stiffness Excessive Thirst Fainting Spells Difficulty Healing Heat/Cold Intolerance Irregular Heart Rate Excessive Scarring Increased Appetite Leg Swelling Itching Weight Changes Cough Rashes Difficulty Breathing Dizziness Shortness of Breath Frequent Falls What type of shoes do you wear most of the time? What is your shoe size? NEW PATIENT HISTORY Mark L. Prasarn, M.D. NEUROSURGERY SERVICES AT APD LOCATED AT UPPER VALLEY MEDICAL GROUP 106 Hanover Street, Lebanon, NH 03766 Phone: 603.448.0447 Fax: 603.448. 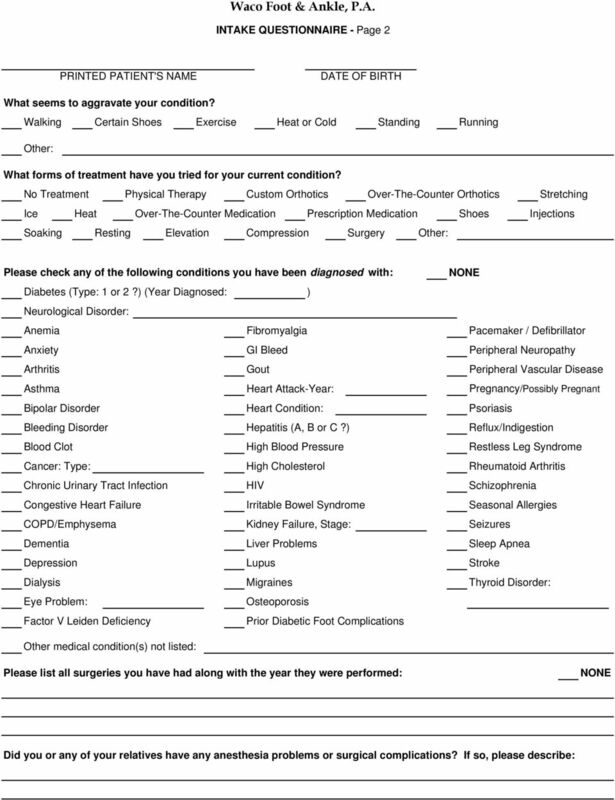 St. Luke s MS Center New Patient Questionnaire. Name: Date: Birth date: Right or Left handed? Who is your Primary Doctor? A photocopy of this document shall be considered as effective and valid as the original. 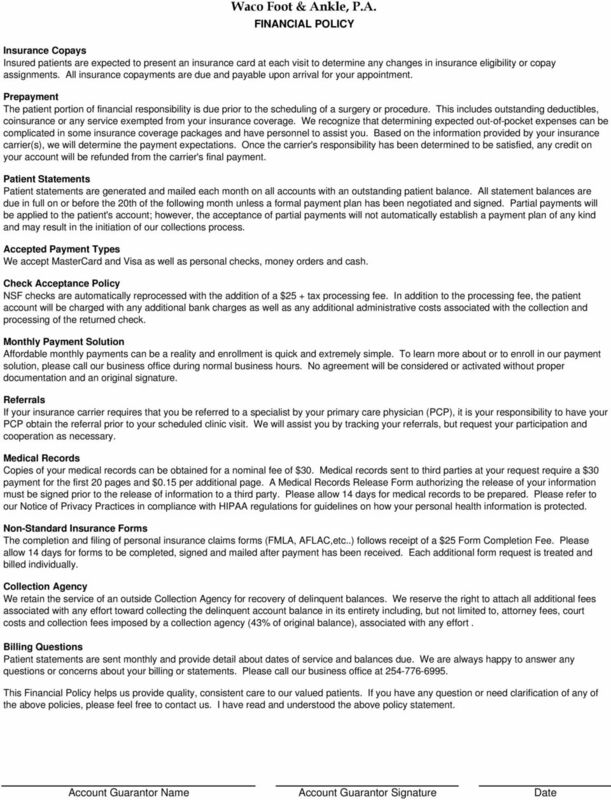 PATIENT INFORMATION - Please complete and/or verify all information and make changes as necessary. Agnes Ju Chang, M.D., F.A.A.D. Welcome! Thank you for choosing our practice for your eye care needs! 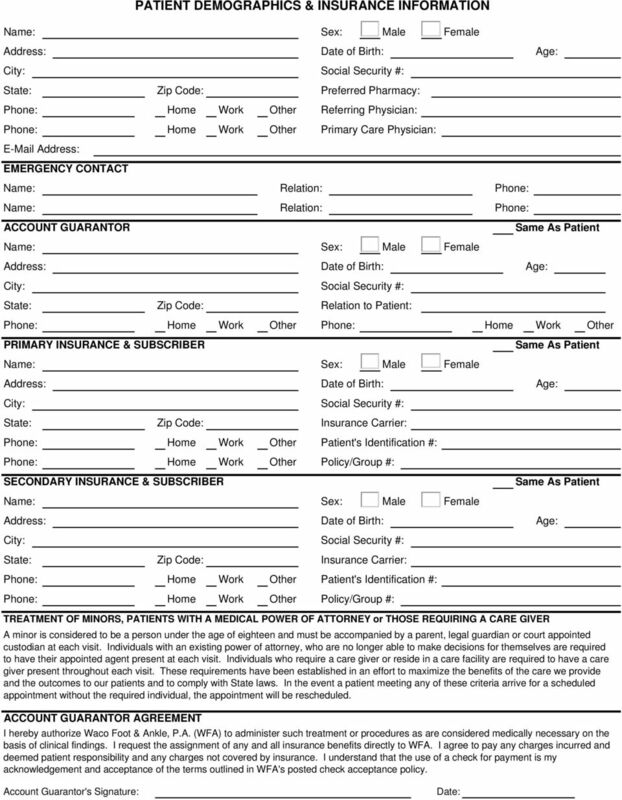 Please fill out our new patient registration paperwork. Thank you for making an appointment with our office. We look forward to serving your visual needs.